I attend the Sheffield Girls High School. 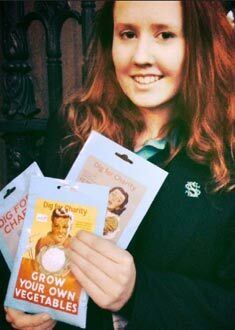 My award winning business is called Dig for Charity and I sell custom made seed packets, donating profits to Weston Park Hospital Cancer Charity - Registered Charity No. 1039885. I am the winner of The Big Challenge 2011 (www.bigchallenge.biz) which is a prestigious competition that encourages young people to become entrepreneurs. The idea was inspired by the WW2 Dig for Victory campaign .. Copyright © digforcharity.co.uk: Herb and Vegetable Seeds - Help Western Park Hospital Sheffield whilst you grow your own herbs & vegetables.